An open program based on weekly units, evolving as a public utility conceived as a constant reference for a growing community, where you can enrol designing your own personal tailor-made educational path through an on-line tool. 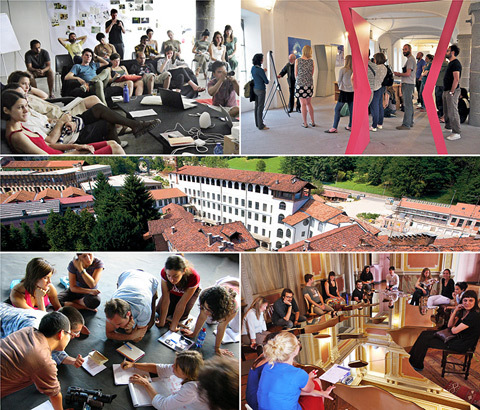 UNIDEE, through a program of intensive and specific weeks, trains “artivators” (activators of processes of social transformation through creative ideas and projects), a professional figure which brings together the characteristics and the skills of the artist, the curator, the entrepreneur and the social planner.The residency weeks will be open to practitioners, artists, scholars, curators, besides anyone interested in delving into specific themes related to artistic practices in the social sphere, developed by the mentors together with a multidisciplinary international group. Weeks are led by experts suggesting a deep analysis of essential competences and aspects: from inter-subjectivity to commons and alternative economies, from responsibility and new technologies to architecture of the social space, implicities and complicities. Manydee is a virtual platform to which UNIDEE residents are automatically registered in order to communicate ideas and information, to cooperate, to propose and discuss projects. UNIDEE 2013 Ayed Arafah (Palestine) ayedarafah.portfoliobox.me Carolina Rito (Portugal) carolinarito.com Charles-Antoine Blais Métivier (Canada) charles-antoine.ca Ilaria Biotti (Italy) ilariabiotti.com Khaled Galaleldeen (Egypt) www.facebook.com/pages/Khaled-Galaledeen/ Marica Vitas (Croatia) vimeo.com/maricavitas Muhammad Sohail Azad (Pakistan) vimeo.com/sohailazad Olga Zhitlina (Russia) www.olgajitlina.net Rabindra Patra (India) www.facebook.com/rabindra.patra Richard Soriano Legaspi (Philippines) cycloneloopfilm.wordpress.com Anastasia Ryabova (Russia ) nastyaryabova.com/ Luisa Ungar (Colombia) www.facebook.com/luisa.ungar UNIDEE 2012 Ayman Alazraq (Palestine) www.aymanalazraq.com Lindsay Benedict (USA) www.lindsaybenedict.com Angela Henderson (Canada) Dina Karaman (Russia) Karl Logge (Australia) www.makeshift.com.au Hektor Mamet (Switzerland / Poland) www.hektormamet.com Alecia Neo (Singapore) www.alecianeo.com Marta Romani (Italy) melmartita.blogspot.it Shah Zaman (Pakistan) www.shahzamanbaloch.com Meghna Singh (India) www.meghnasingh.com UNIDEE 2011 Aastha Chauhan (India) Ángel Masip (Spain) Anna Acciarino (Italy) Cai Weidong (Cina) caiweidong.com Eduardo Cachucho (South Africa) efrcdesign.com Ekaterina Kravtsova (Russia) www.craftsova.com Elmas Deniz (Turkey) sites.google.com/site/elmasdeniz Ibada Wadud (USA) ethos-diseno-blog.tumblr.com Ibrahim Jawabreh (Palestine) Karolina Rychlik (Poland) Matthew Mazzotta (USA) matthewmazzotta.com Nicoletta Daldanise (Italy) www.shareproart.net Olga Karyakina (Russia) Özgür Demirci (Turkey) www.ozgurdemirci.com Raphael Franco (Brasil) raphaelfrancoart.wordpress.com UNIDEE 2010 Alexandrija Ajduković (Serbia) www.aleksandrijaajdukovic.blogspot.it Alioum Moussa (Cameroon) alioummoussa.wordpress.com Anna Moreno Castells (Spain) www.annamoreno.net Arnaud Hollard (France) Bora Petkova (Bulgaria) Chiara Tinonin (Italy) Davide Ligas (Italy) Inass Yassin (Palestine) www.inassyassin.com Juliana Mori De Oliveira (Brasil) www.julianamori.com Kosta Tonev (Bulgaria) www.kostatonev.com Maggie Lawson (USA) Maria Jobelle Tayawa (Republic of Philippines) Sara Hany Mohamed Abed (Egypt) Veronica Tzekova (Bulgaria) UNIDEE 2009 Asiya Wadud (USA) forageoakland.blogspot.it Bona Park (South Korea) www.bonapark.co.uk Camille de Galbert (France) www.camilledegalbert.com Cecilia Guida (Italy) David Behar-Perahia (Israel) www.davidbehar.net Diego Bonetto (Italy) diegobonetto.com Diego del Pozo Barriuso (Spain) Hani Amra (Palestine) www.haniamra.com Julia Staniszewska (Poland) Marcela Ceballos Gonzales (Colombia) Natalia Gil Medina (Colombia) Saioa Olmo Alonso (Spain) www.ideatomics.com Sumakshi Singh (India) www.sumakshi.com Yana Kostova (Bulgaria) UNIDEE 2008 Yael Bar-On Biljana Ciric Yolanda De los Bueis www.spyoy.com Manuela Macco www.manuelamacco.com Ahmad Malki www.idiomsfilm.com Elisa Marchesini www.elisamarchesini.com Pavlina Mladenova Josefina Posch www.josefinaposch.com Christoph Schwarz www.christophschwarz.net Marko Stamenkovic Sakiko Sugawa http://hanareproject.net Nidhi Sundram Daniel Alejandro Urrea Peña Yulia Usova http://yuliausova.blogspot.it Sarah Vanhee www.sarahvanhee.com Flávia Vieira UNIDEE 2007 Rei Dishon www.agora-gallery.com/artistpage/rei_dishon Wafaa Yasin Chelsea Knight www.chelseaknight.com Ika Peraic www.freelanced.com/ika_a Juan Pablo Jimenez Carvajal Marthe Van Dessel www.ooooo.be Lieven Paelinck Andres Torca Nerita Oeiras http://kuaishen.tv/nerita Jason Waite Fiona Whitty www.fionawhitty.com Rotimi Batatunde Francesca Montà Sakshi Guptà Vicentiu Gârbăcea http://vimeo.com/vicentiugarbacea Zofia Wollny Natalia Pershina http://factoryoffoundclothes.org UNIDEE 2006 Qiu Jun Paula Andrea Rengifo Valencia Nataša Perković Tehila Lapidot Antonella Alunni Raouf Haj-Yihya Ajay Kumar Tiwari Rakhi Peswani www.guildindia.com/RakhiPeswani Liron Shua www.lironshua.com Katia Meneghini http://katiameneghini.com Christian Niccoli www.christianniccoli.com Julieta Aranda Nazgol Ansarinia Francesco Perratone Andy Abbott http://andyabbott.co.uk & Yvonne Carmichael www.yvonnecarmichael.com UNIDEE 2005 Saϊd Aϊt El Moumen Aziz Čeho Eunji Cho www.akive.org Gayle Chong Kwan http://gaylechongkwan.com Vered Dror Michele Fontana Shadi Habib Allah Ke Jipeng Dejan Kaludjerović Eden Morfaux Victor Andrés Muñoz Martínez Andrea Paoletti Sigrid Pawelke Enza Reina http://iorejna.blogspot.it Esther Ribot Cabarrocas UNIDEE 2004 Isabel Andreu Roglá ts Beall www.stillstatic.tv Mary Bellamy Beatrice Catanzaro www.comune.bologna.it Rafram Chaddad Daniel Cuberta Touzón www.danielcuberta.com Pratul Kumar Dash Matteo Ferrario Tania Goloviznina Ishan Gosh Will Kwan Walid Maw’ed Alfredo Luís Vásquez Elorza Sarah Rifky http://d13.documenta.de Alejandro Vásquez Salinas http://portafolioalejandrovasquez.blogspot.it Margarita Vazquez Ponte http://margavp.wordpress.com Peter Verwimp Çagil Yurdakul UNIDEE 2003 Iman Abou Hmid Vaibhav Bhawsar www.recombine.net Jean Charles Boilevin http://aaars.free.fr/html/cvars/boilevinCV Ryan Doolan Oier Etxeberria André Guedes Hannah Hewetson www.hannahhewetson.com Ayumi Minemura Michal Oren Chiara Pirito www.chiarapirito.com Kai Takeda Rufus Willis UNIDEE 2002 Anas Al-Aili David Cañavate Cazorla www.despachodepan.com Cutler Joe www.joecutler.com Enslein Ulrike Brigitte Kameli Katia www.katiakameli.com Marzabal Galano Miquel www.blogger.com/profile/11025623738598426160 Meshulam Liron Modrinjak Matej Paes Leão Daniela www.dpl.nu Scaria Gigimon Sousa Cardoso João Solè Coromina Laia Raphaëlle de Groot www.raphaelledegroot.net Bryan Davies & Laura Quarmby www.bryanandlauradavies.com Aya Iguchi Steve Duval www.stevenduval.com UNIDEE 2001 Chung Haessen Agustin Parra Grondona Natalia Restrepo Brigitte Zerle Ulrike Kohnen-Zülzer Raphaële Maffesoli Charlie Jeffery http://charliejefferyunderconstruction.blogspot.it Consol Rodríguez www.consolrodriguez.info Dafna Moscati Temsyanger Longkumer Oscar Vargas Hernandez Dirk Vogel www.dirkvogel.com Maria Joao Calisto Cameron Sinclair http://cameronsinclair.com Markus Weber www.markusweber.com.au UNIDEE 2000 Biju Joze www.gallerysoulflower.com/AI-104-Biju-Joze Leopold Kessler http://leopoldkessler.net Thomas Dale Gloria Safont-Tria Jaume Parera Casals Esther Knoblich & Steffen Wolfrum Armin Mobasseri http://arminmobasseri.com Benoît Roussel Yoav Weiss www.yoav-weiss.com Juan E. Sandoval Natasha Janković UNIDEE 1999 Gunter Anderlik Tal Adler http://memscreen.info Rotem Balva Laurent Barnavon Olivier Feraud www.kalerne.net/olivierferaud Sophie Fougy Fabrice Gallis Simone Girault Lyn Lowenstein www.lyn.lowenstein.eu Peter Lütje Masahiro & Fumijo Morigouchi Astrid Nippoldt www.astridnippoldt.de Judith Pichlmueller Tania Ristovski Bojan Sarcevic www.bojansarcevic.net Thomas Seidemann Naomi West Maria Wimmer Haegue Yang www.heikejung.de Akiyoshidai International Art Village http://aiav.jp Others: Michael Blum (Rijksakademie 2001), Suwan Laimanee, Cees Krijnen, Martin Koppenhöfer, Ives Maes, Paolo Angelosanto, COPA & SORDES: Birgit Krueger & Eric Schmutz Krueger, Noraset Vaisayakul (Rijksakademie 2004). A.M. QATTAN FOUNDATION based in Ramallah, it's one of the most longstanding partner of Cittadellarte, they provide a UNIDEE grant for Palestinian Artist since 2002 AS_TIDE NETWORKS supported by the European Union, As_Tide is a project that aims at constituting a European network of cultural centres and operators dedicated to intercultural dialogue and socio-economical development,to analyse and promote the sense of collective identity through different cultures in Europe. In 2008 and 2009, four participants in As_Tide will be also residents at Unidee. BRYAN AND LAURA DAVIES space and project developed by former resident Bryan Davies and his sweet wife Laura Quarmby in Leeds, UK. CASTELLO DI RIVOLI Contemporary Art Museum. They have always supported the activity of UNIDEE and Massimo Melotti, head of the Press Office, is part of the UNIDEE jury and experts panel. FONDAZIONE ZEGNA based in Biella, the Foundation has supported UNIDEE since 2000 establishing Scholarship grants for residents coming from South America and China. In 2007 Matteo Ferrario and Margarita Vazquez Ponte (UNIDEE 2004) delevoped and realised Casa Zegna, archive and cultural centre of the company. LUISS UNIVERSITY one of the most succesful university campuses in Italy (Rome), they offer an innovative learning model. The General Director, Mr. Pier Luigi Celli, expert in communication and business organisation, is one of UNIDEE's experts. NEXT KUNST Partner of As_Tide and becoming a partner of UNIDEE, providing a grant for an Austria-based resident. We met Louise Kloos during a Nurope oasis. PEPINIERES EUROPEENNES POUR JEUNES ARTISTES for 15 years, the Pépinières européennes pour jeunes artistes has had the mission of promoting the emergence and the mobility of young artists on a worldwide scale. UNIDEE is part of their network and Cittadellarte is member of the Board of Directors. ST. JAMES CAVALIER Partner of As_Tide and becoming a partner of UNIDEE, providing a grant for a Malta-based resident. IFPC UNESCO-ASCHBERG The UNESCO-Aschberg Bursaries for Artists offers a scholarship grant to an artist from Asia, Africa or Latin America to enable them to engage in an intercultural dialogue and expose them to cultural diversity. UNICREDIT GROUP is one of the largest banking and financial services organisations in Europe. Since 2005 they have supported UNIDEE with Scholarship grants dedicated to creative people from Eastern Europe. WWW.YOAV-WEISS.COM This is the web site of Yoav Weiss, Israeli artist that was in Residence in 2001.